I am pro lifehacks. Of course, lifehacks have a valuable place in our everyday lives. I’m also pro money hacks. Money hacks are the little tricks you can use to stretch a dollar until it breaks. For example, during my college years I kept myself fed with the one cent sale item at Publix. Once, I bought ten packs of one cent hot dogs, and I didn’t waste a single dog. I recently learned about a money hack that is significantly less disgusting than eating generic hot dogs for weeks. It's a browser extenson called Evoshare. EvoShare helps users earn 2-10% cash back on certain online purchases. You can apply your cash back to retirement savings, college savings, or to student loan debts. This money hack won’t save you millions, but it’s a great place to start your saving journey. Here’s what you need to know. Like these other sites, EvoShare has an easy-to-install browser extension. The Extension turns red when you navigate to a retail partner. If you click the extension, you’ll automatically earn cash back rewards. Cash back rewards stack with credit card rewards and store specific promo codes. So What Makes EvoShare Different? The concept of 'saved savings'. Other cash back websites put money into your PayPal account. That makes it easy to spend your savings instead of using the money to invest in your future. EvoShare doesn’t put the money in your checking account. Instead, you hook up a student loan debt account, a retirement account, or a college fund for your kids. EvoShare deposits your money there. How Can I Maximize My Cash Back Rewards? EvoShare offers a few great ways to maximize your cash back rewards. First, you can install the browser extension. That makes it easy to activate rewards. You’ll even get a little message saying that your rewards are activated. Second, you can maximize rewards through stacking. The cash back you earn from EvoShare works on top of other promotions. For example, you can apply a free shipping promo code to a website. You can also stack EvoShare savings with credit card offers. For example, the 3% savings from EvoShare with your 5% savings from a Target RedCard for an effective savings of 8%. Alternatively, the 7.5% Groupon savings from EvoShare can be stacked with your credit card’s 2% cash back rate for an effective savings of 9.5%. 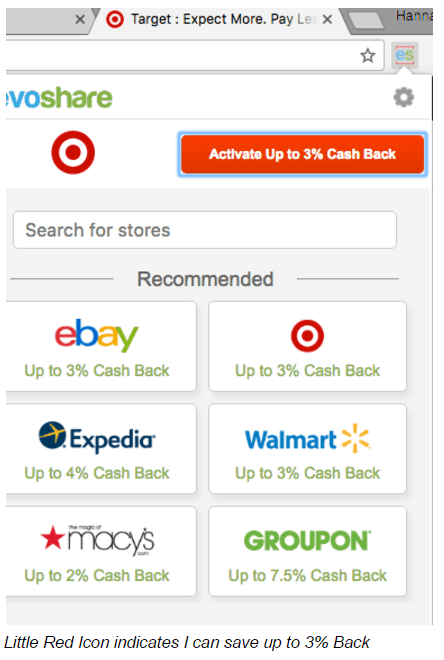 It’s important to note that EvoShare cashback rewards cannot be stacked with savings from other cash back websites. Finally, if you’re in California, EvoShare can help you save money when you shop at local coffee shops, grocery stores, and convenience stores. If you connect your credit or debit card to EvoShare, they’ll give you cash back when you visit their brick and mortar partners. They’ve developed relationships with over 10,000 brick and mortar stores and restaurants in and around San Francisco. EvoShare users should note that Walmart, Target, and Macy’s are online partners with EvoShare, but you won’t earn cash back if you shop in the stores. How Does EvoShare Compare To Other Cash Back Sites? EvoShare is about half the size of the largest cash back websites (Mr. Rebates and Ebates), but they have most of the biggest online partners. EvoShare consistently passes 75% of the referral link savings onto the customers. In general, this means that you get more cash back from EvoShare than you do from other websites. One drawback to EvoShare is that it won’t look for coupon codes for you. Cash back site, Ebates curates coupon codes, so you can save even more money. EvoShare is a great money hack. Earning 2-3% cash back and depositing it into your retirement savings can help you move in the right direction. You won’t get rich from EvoShare, but it’s a nice trick to have on hand. If you’re going to use any browser extension EvoShare is a good choice because of the superior cash back rates. It’s also a good choice because you won’t fritter away the savings. Have you heard of EvoShare before? Do you use any other cash back apps? EvoShare is a cash back site that helps you pay back student loans and save for retirement. Check out this EvoShare review to learn more.